Hamster Club :: Will normal household foods poison my hamster? Will normal household foods poison my hamster? Hamster food can look a little boring and sometimes it is tempting to offer your hamster little treats from the kitchen. The desire to treat your hamster to some much more appetising looking food is very understandable. As, with the best will in the world, we cannot help but sometimes think of our animals in terms of our own human values. In ourselves the concept of having a nice gastronomic treat, or a tasty snack to indulge yourself occasionally, is something that we can all relate to and enjoy. Whether animals share in these higher level pleasures in life, with or without a touch of guilt over whether it is good for them or not! I guess we will never know for sure. What I do know is that when watching the behaviour of animals given something new and potentially interesting to eat. You can see from the investigative behaviour and body language, that they are certainly more excited and appear happier than when presented with the same old stuff all of the time. Assuming that we all want to see our hamsters happy and make their lives as interesting as possible. I�m sure that we would want to give them a little treat and dietary variety from time to time. As responsible pet owners what foods can you safely give your hamster? Hamsters eat mainly vegetable matter of different types. Usually in pet hamsters this is given in the form of dry mixes, composed mainly of seeds and nuts. They can eat additional foodstuffs including fresh vegetables and plants. These can have additional benefits for the hamster, providing a valuable source of vitamins and fibre. We will cover the normal hamster dry foods in a separate article so what I want to concentrate on here is the additional foods that they can be given. 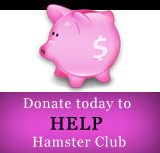 It should be remembered that hamsters have small appetites and on average eat only about 6 grams (1/4 oz) per day. Much more food than this can disappear from the food bowl but you will usually find it stashed away in the bedding area. Therefore, whatever you chose to feed them it should always be in small amounts. 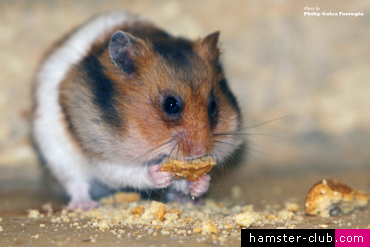 Hamsters can be given a variety of different foods including fruit, vegetables, wild plants and nuts, bread, cooked eggs, breakfast cereals, cooked meats and some insects. Fresh foods and green stuffs should be offered in small quantities and any that is left uneaten should be removed daily, to avoid decay. If fresh food is given it should be done on a regular basis so as not to upset the hamsters digestive system, which will adapt to accommodate it. Good examples of fresh foods that most hamsters will enjoy are small pieces of sweet desert apples, carrots (peeled and chopped), cucumber and even some wild plants such as dandelions. 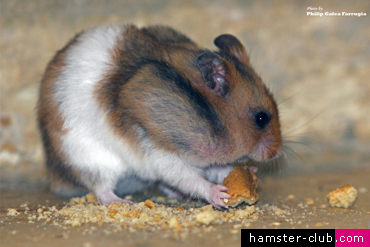 Hamsters will also eat some invertebrates such as mealworms and crickets. Dwarf Russian hamsters are particularly fond of these. Any of these foods which you may choose to feed your hamster should be well washed, particularly wild flowers and plants. 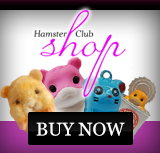 You should also make sure that you identify them accurately so that you know exactly what you are giving your hamster. There are also a number of foods that should not be given to hamsters and some that will harm them. Neither of these lists are complete and if ever in doubt about whether you should feed something to your hamster seek advice and if still in doubt simply avoid it. So as you can see there is certainly a lot more choice available to you and your hamster in foodstuffs, so try some out gradually and find out what is your hamsters favourite treat.